Learn more about our friendly team! Learn More About Pediatric Dentistry Today! Creating Winning Smiles, with care! 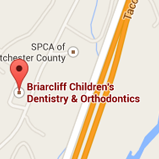 At Briarcliff Children’s Dentistry and Orthodontics, we combine the specialties of pediatric dentistry and orthodontics under one roof to serve the communities of Briarcliff Manor, Pleasantville, Ossining, and surrounding communities in Westchester County, NY. This multidisciplinary approach allows our specialists, Dr. Ann Guerra and Dr. Jessica Levy, to provide the very best comprehensive dental and orthodontic care to you and your family. Along with our friendly team, Dr. Guerra and Dr. Levy work closely together, taking care of both the dental and orthodontic needs of patients in the same visit. At our office, your child’s dental health can be followed from the early primary teeth stage through adolescence to a well-aligned adult dentition. This prevents the need for multiple visits to different offices or providers. Our patients and their parents greatly appreciate this streamlined approach. Please feel free to contact our Briarcliff Manor office to schedule an appointment or complimentary orthodontic consultation. We look forward to helping you or your little one to a lifetime of healthy, happy smiles! Along with Dr. Guerra, Dr. Levy, our pediatric dental specialist, treats each patient as a unique individual in a caring and friendly environment. We strive to provide the children of our community with the foundation for a lifetime of healthy smiles. This begins with preventive dentistry, examinations and cleanings, dietary analysis, home-care instructions, and restorations such as fillings and bondings. For patients in need of a little extra TLC, we also offer sedation and hospital dentistry. Everyone deserves a beautiful, straight smile, no matter what his or her age is. Dr. Guerra also specializes in orthodontics for children, teens, and adults, providing traditional metal braces, clear braces, Invisalign® and Invisalign Teen® clear aligners, and Simpli5™ aligners.